Matthew Peterson: Let me ask you the bonus questions. Matthew Peterson: So you’ve done 650 school visits, thereabouts? Matthew Peterson: What’s the funnest thing about doing school visits? 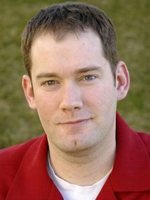 Brandon Mull: Um . . . .
Matthew Peterson: Or was there a funny experience that happened when you were doing them? Brandon Mull: For me, one of my coolest experiences was when I did school visits in Hawaii, because it was really neat. At the start of every school presentation that I did, little Hawaiian kids would come up and put leis on me. Brandon Mull: This was on Kawaii and Oahu. And so it was just like ridiculously cute and friendly and welcoming. Brandon Mull: That was really fun. In general, it’s fun to do school visits because it’s an interesting way to see the country. Where instead of going to necessarily see landmarks or sights, you go into communities and you meet with teachers and kids and readers, and you go to libraries and bookstores and schools and kind of get more the vibe of the community than you would just as a casual tourist. Matthew Peterson: Yeah. I agree. School visits are definitely my favorite thing to do. Brandon Mull: It’s a great way to stay connected with readers too, you know what I mean? Like as you talk to these kids about what you’re writing, it becomes pretty quickly apparent what they like about what you are writing, you know what I mean? And what they’re eager to hear more of or what bores them or what interests them. And that’s healthy I think, to kind of stay in touch with your audience. Matthew Peterson: And these kids will remember you for the rest of their lives. We only had a few guests when I was in elementary school, but I still remember those guests. And I’m sure many of the thousands of kids that you’ve spoken to, same thing, they will remember you their whole lives. Brandon Mull: Yeah, hopefully, hopefully. If you bring them a good message, and if you’re writing fun books. And once a kid reads a book and likes a book, that’s when an author becomes a celebrity in their minds, you know what I mean? Brandon Mull: Once they go, “Oh wow! That took me on a great ride!” Then all of a sudden they’re excited to meet you or even shy to meet you, which is funny and cute. Brandon Mull: Right. Yeah. I’ve totally had that. I’ve had that exact moment, like little shy kids peaking down isles at the grocery store and . . .
Matthew Peterson: Yep. [laughs] Well, let me ask you one more quick question. What’s the best thing about being an author? Brandon Mull: The most satisfying thing about being an author is being able to take these stories that have lived in my mind for so long and share them with other people. Brandon Mull: I literally felt a lot of my life like I was going around with this secret life in my head that nobody knew about. Brandon Mull: And this is a way to share something that’s . . . these stories have been a big part of my life, my whole life basically, and it’s really neat and weird and cool to share them and actually have other people enjoy them. Brandon Mull: Yeah, I know. That’s the big fat relief part of being . . . of what’s happened with my career is that it’s found enough of an audience that it’s comfortably the day job. And who doesn’t dream about that? Having their hobby become their job and pay the bills, you know? Brandon Mull: And they do lots of grassroots, lots of person-to-person kind of contact with their authors. Matthew Peterson: Now you definitely came up with this idea, you know, years and years ago. Have you seen the new TV show Sanctuary? Brandon Mull: I haven’t seen Sanctuary, yet. No, no. I’ve heard of it. Matthew Peterson: [More questions from the fans] And did the Sphinx give Kendra the backpack to help her escape? Brandon Mull: That has to remain a mystery. It’s a pretty good guess, but it has to remain a mystery. That’s something from book 4. Brandon Mull: You will find out who gave her the backpack in book 5. It’s an event that happens in book 4. Matthew Peterson: Okay. And this is an interesting one: After Seth stole the horn from the centaurs, Grandpa stated that Seth "would be the death of him." Was this a foreshadowing or simply casual talk? Brandon Mull: We will have to see. We will have to see. It’s a good question, but it would reveal too much to say either way. Matthew Peterson: Yeah, you can tell these kids have been thinking about this. Brandon Mull: Those are good questions. Those are questions from readers who’ve given the series a close reading. Brandon Mull: You know, I try to write the books in such a way that close careful readers get rewarded for paying attention: lots of little hints and lots of little things that I’ll drop in book 2 will then go on to have more significance when you read 4 and 5. I like it when a series does that and I assume readers like it as well. That’s why I do it. Brandon Mull: I think Candy Shop War has a ton of cinematic potential. I know my agent’s still a big believer in it. So we’ll just see. It’s kind of the same story as Fablehaven. There seems to be a good deal of interest, but we don’t have a production schedule yet. Brandon Mull: [referring to Candy Shop War teaching kids to take candy from strangers] If they read the first, you know, like the first third and then quit, they could complain about that. Brandon Mull: Yeah, I know, it’s fun. All my books have a little bit of psychotic-ness to them, just ‘cause to me that’s partly what makes the story interesting: is kind of a strange hook or strange twists and turns. And Pingo’s definitely this idea that, you know . . . well: what made me think about it in the first place was trying to decide when and why I ended my relationship with my imaginary friend as a kid. Brandon Mull: And I thought a fun way to explore that would be, “What if you tried to break up with your imaginary friend and the imaginary friend wouldn’t go away--just became your enemy instead?” And so even though that can be sort of a psychotic premise . . .
Brandon Mull: . . . I end up taking it down a funny road. Brandon Mull: It’s just a story about friendship and imagination. It’s my only children’s, little kid, illustrated picture book I’ve written it so far. The reason I wrote it was ‘cause I’ve got three kids of my own who are six, three, and one and I realized I hadn’t written anything for them. Brandon Mull: And Pingo just really fell into place. The illustrator is Brandon Dorman. And he’s illustrated all my other books and interiors and I’ve got a really good relationship with him. And he totally delivered on Pingo--made a really terrific illustrated kids book. Matthew Peterson: Well your books are definitely well illustrated. The covers are, of the books that are out there, just very good. So I do have to say that. And Pingo--I haven’t seen Pingo--but if, you know, the same illustrator did those, then it must be... it must be good, ‘cause the illustrations are just fantastic. Brandon Mull: Yeah. Pingo is my newest thing. It just barely came out at the end of this past summer. So if you’ve got little kids, it’s the Brandon Mull book for your little kids. It’s worth checking out. The good thing about a picture book is you can browse it really easily. Brandon Mull: Like it takes two minutes to see what you’re buying and to see if you’d want your kids to have it. Matthew Peterson: [referring to Brandon’s dancing at the Book Babe event with Stephanie Meyer] I hear you’ve done some comedy. You’ve done some comedy, and you’ve done a lot of different things. Brandon Mull: Yeah, no, I ran a sketch comedy troupe for a bunch of years. So if I’m going to dance, it’s going to be like funny, goofy dancing. Brandon Mull: Not anything that would ever land me a dancing gig. Brandon Mull: But that’ll start in 2011. So the year after Fablehaven ends, we’ll see this new Beyonders series start. And Simon and Schuster has made a real commitment to it. I think it’ll have probably the biggest push of my books so far.